This week on Now and a Long Time Ago, GM heads up Wisconsin to the old Georgetown theater. At the center of this collage is a photo of the block from 1960 (it might help to click on the photo to blow it up). At the center you can see the theater. At the time it was still an active and functioning theater. It was to remain open for another 26 years after this photo was taken. 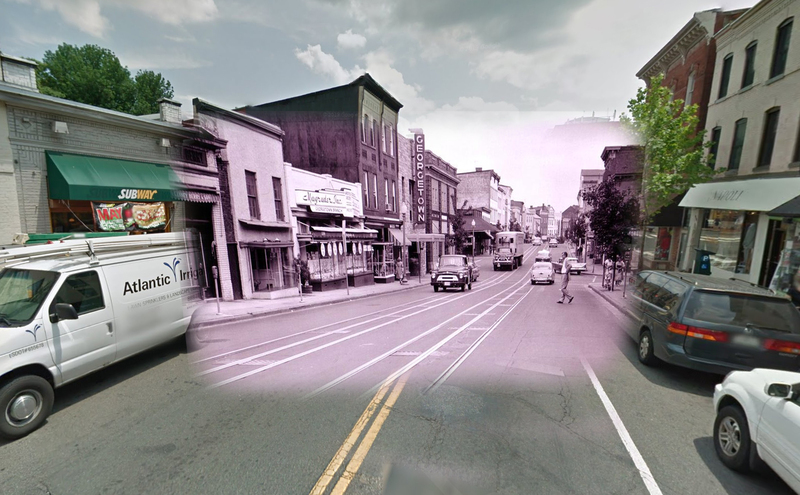 This week in Now and a Long Time Ago, GM visits the east side of Wisconsin Ave. just north of Prospect St. The photo above comes from the National Archives and shows the block as it appeared in 1950. This week on Now and a Long Time Ago, GM heads up to Book Hill. Nowadays, Book Hill is a beautiful little hillside park that offers an even more beautiful view from the top. It is named, of course, after the stately public library that crowns it. It’s been a while since GM has written a new entry for the Now and a Long Time Ago series, but today he ends the wait. Unfortunately he had some technical difficulties and can’t publish the “swipe” photo. Static photos will have to suffice. Today’s location is the southeast corner of Thomas Jefferson St. and M. It currently houses Juicy Couture, but for over 100 years this building housed the Birch Funeral Home. Started in 1861 by Joseph F. Birch, this funeral home served Georgetown until the mid 1960s. Joseph apparently was a cabinetmaker too (which makes sense given the similarity between a cabinet and a coffin). 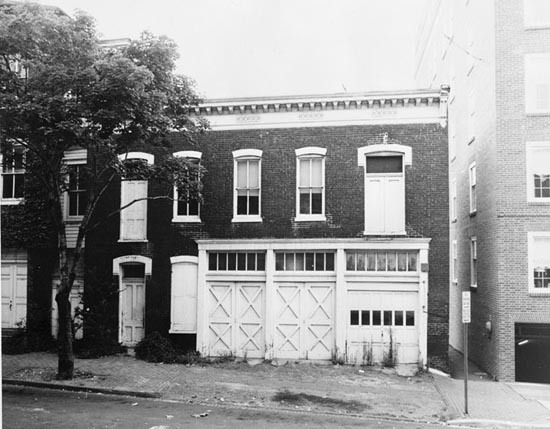 This week on Now and a Long Time Ago, GM stops by the old Car Barn on M St. 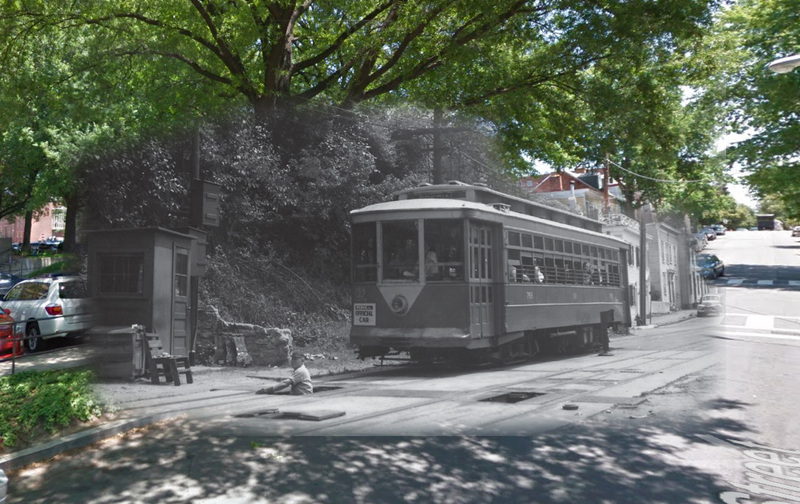 Above you can see what it looks like today, and what it looked like in 1894 when the crews were carving a huge chunk out of the cliff in order to fit in the giant streetcar station. As GM has written before, the station, called Union Station, was originally built for cable cars, which is what the Washington and Georgetown railroad used for the first two years of the station’s operations. The building continued to be used by various streetcar companies until the system was dismantled in 1962. It passed through several hands before ending up owned by Douglas Jemal. He rents it to Georgetown University for use as classroom and event space. Now and a Long Time Ago: Wisconsin and K St. 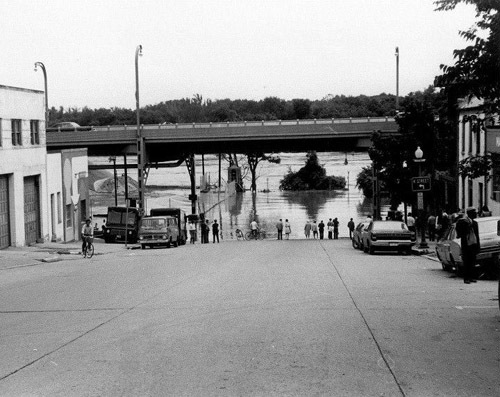 This week on Now and a Long Time Ago, GM visits in with the great flood of 1972. The old photo comes courtesy of the fantastic Old Time DC Facebook page. The photo is of lower Wisconsin Ave. after Hurricane Agnes blew through. This spring hurricane was the costliest hurricane in history until Hurricane Frederick passed it in 1979. From the photo, you can see that the Potomac flooded right up to the bottom of Wisconsin. By comparison, as heavy as Sandy was, the Potomac water levels remained several feet below cresting the waterfront, let alone lapping up to Wisconsin. As for the built environment, you can see a couple changes. The Whitehurst looks mostly the same, although historic lamps were added at some point. The incinerator that would eventually be torn down and turned into the Four Seasons/movie theater was still there.